* We frequently add new features to Advantage Online. Check back here to see what's new. * Have a special need? Use our feedback form to request your special features. 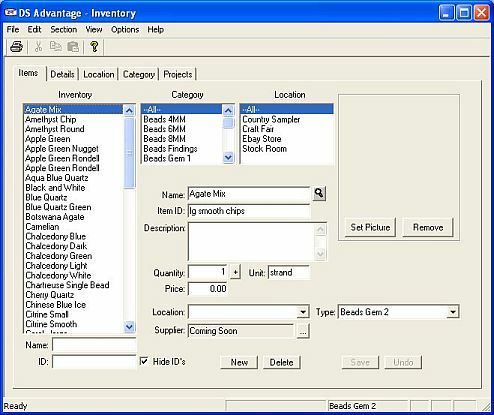 Manage inventory, sales, customers and accounts from your PC. Works with Advantage Online by syncing data. View your data on the web or on your PC. Provides security by saving your data offsite. Pre-release version available in the Downloads section. (More information coming soon). This is a pre-release version of Advantage Suite. Currently only inventory and projects sync to Advantage Online. The pre-release version will need be updated before January 1, 2006. Create your own Advantage Online account to sync with -- click here.